We were in Sedona on vacation, staying at a house near Cuisine of India aka Indian Palace, India Palace and Delhi Palace. I don’t know what the actual name of the restaurant is, I’ve found reviews under all names. We wen there for lunch a rainy day in August, 2013. According to my daughter, this was the smallest buffet at which she’s ever eaten. That’s not necessarily true for me, but with ten or so offerings, including rice, it would definitely not win any prizes for size. Then again, it also doesn’t seem to be very popular, at least for lunch, so few offerings hopefully mean the food is fresher. As far as Indian food goes, this buffet was pretty average. I liked the mushroom korma, but the chicken tikka masala was underseasoned (even though it was a bit spicy). The same can be said for the chicken tandoori, it didn’t taste as if they’d use any spices on it other than pepper. The lamb curry was OK, though the lamb was a bit dry and tough. The rice was a bit too starchy for my taste, but the garlic/herb naan bread, served pipping hot, was quite good. Sweet lassis also lacked flavor. As far as the restaurant itself, it was your run-of-the-mill shopping center restaurant, it didn’t have any ambiance to speak of. It’d been 6 years since my original visit to (and review of) Taste of India in Buttonwillow and I was a bit surprised to see that things haven’t changed that much. The restaurant seems a bit more run down, the menu has been streamed line and now you order at the counter, but the restaurant still serves mostly North Indian food at relatively high prices (dishes are mostly priced around $11, same for dinner and lunch). The food is pretty good for Indian food in the middle of nowhere, but not outstanding. 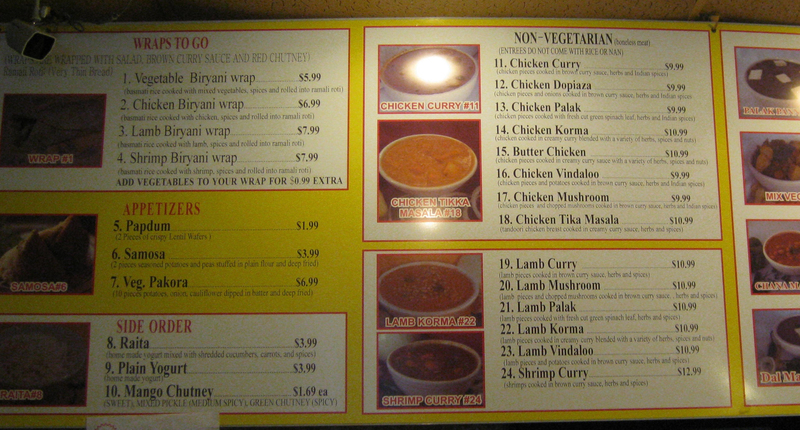 We ordered our standards, chicken tikka masala and lamb korma (both $11), with a side of garlic nan and a large rice. The rice was purely white, no hints of saffron or mixed peas for appearance sake, which is fine with me. The nan was a bit thin but passable. The curries were better. The lamb korma was probably the best of the two. The pieces of lamb were tiny, but they still had considerable flavor. The curry was smooth and balanced. I liked it. The tikka masala substituted salt for smokyness, and its sourness was too one-noted, but it was still OK. Mika liked her mango lassi and I my sweet one, which once again was almost too sweet. In all the meal was pleasant but we spent over $40 and only ordered two entrees, too expensive a lunch. We’ll probably stop at Taste of India again, but given the prices and the location (a bit too close to LA), it may be a few years. In the last couple of weeks I’ve gone to Favorite Indian twice, once for lunch and once for dinner. Their offerings are just as extensive for both though the dinner buffet, only available on F/Sa/Su is more expensive ($15 vs. $11, I think). Still, it’s an amazing deal considering that you get over 20 choices of dishes, plus nan bread, sodas, juices and dessert! And keep an eye on Yelp and their Facebook Page for special offers. Mentioning “Yelp”, for example, should get you a 15% discount off the buffet prices. But the deal with Favorite Indian is just how amazingly good their food is. I mean, this is buffet food (they do have a la carte dinners weekday nights, but why would you bother?). And it’s some of the best tasting Indian food I’ve ever had. In my last two visits the chicken tikka masala has been to die for. The chicken itself is a bit dry (that’s what you get when you use white meat), but the sauce is heavenly. I don’t bother with the chicken anymore, just put the sauce over rice or eat it with nan. At a dinner visit, I couldn’t get enough of the fish pakoras. The flaky, melt-in-your-mouth fish has a wonderfully crispy crust and was delicious. Their tandoori chicken has also been very good in my last visits, as have been assorted curries. They vary from time to time, but they are all worth trying (even if not all are always winners in my book). My daughter loves their soft serve mango ice cream for dessert, but I’m a fan of their gulab jamun. which they serve both hot and cold (hot is better). Their nan bread is quite good, but at the lunch buffet I went they had a paratha sytle bread that was even better. Anyway, I’m in love with Favorite Indian and I can’t wait to go back. I’ve been back to both the lunch and dinner buffet at Favorite Indian several times now. It’s always good. Mika loves going for the mango soft-serve ice cream. Favorite India on “A” Street in Hayward has been my favorite Indian restaurant in the area since it opened. The small, humble dining room isn’t much to look at – but the Americanized Northern-Indian food is delicious and the staff is very friendly. Plus, and this is a very important plus, they deliver to San Leandro. Some months ago they opened a new branch in Hawyard, under the name “Favorite Indian” and we finally checked it out last January, when we discovered the A St. location is no longer open for dinner. The new location is a great improvement. It’s in what was probably an all-American family restaurant in the past, so it hasn’t much in the way of atmosphere, but they’ve added a couple of nice fountains and some decorations and the place looks nice enough. More importantly it’s comfortable, with plenty of booths and tables that accommodate large parties (there is even a party room, I think) and there is plenty of room for a large buffet – which they now offer not just for lunch but for dinner on Friday, Saturdays and Sundays (6 – 9 PM). In the last seven months I’ve been to Favorite Indian for lunch and dinner on numerous occasions – and I’m always impressed by the buffet. It has an enormous array of choices, more than 30 items, so much that you cannot possible hope to try everything (even if, like me, you just skip the vegetarian options as a matter of course). Last night the meat offerings alone included chicken tikka massala, chili chicken, ginger chicken, chicken tandoori, lamb vindaloo and a lamb kofta curry. There were many vegetarian choices, including vegetable pakora and daals, There are soups and salads and the usual accountriments – including rice and hot naan. The buffet price ($14 for dinner) includes soft drinks and dessert (mango soft ice cream in addition to Indian goodies). What is really impressive, however, is the quality of the food. It may not have the sophistication of the offerings at Aroma in Castro Valley, but it’s uniformly tasty, nicely seasoned (i.e. not too spicy) and very balanced. 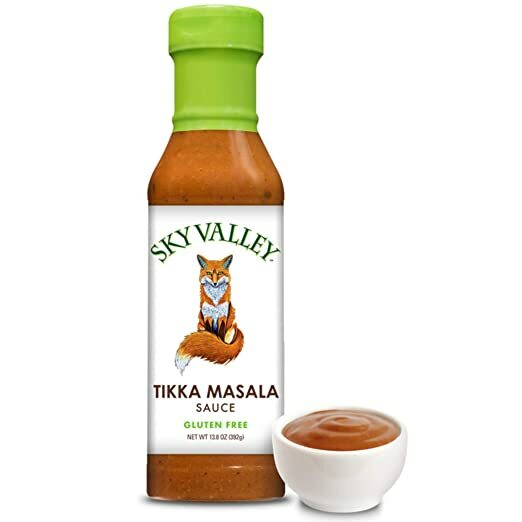 Everything, from the tandoori to the tikka massala sauce tastes great. Nothing is too oily, nothing too fatty or gritty. The chicken in the tikka massala did manage to be a bit too dry for my taste in my last visit, but that was really a minor complain. In all, I don’t think you can get a better meal in the Bay Area for the price – one reason why I keep going back 🙂 BTW, you can get a 15% off discount of your dinner bill by mentioning “YELP” when you visit (I’m trying to see if they’ll do the same for “Marga’s Blog”). Restaurant.com also has gift certificates, but it’s only valid on the a la carte menu, Sunday through Thursday.